The Devil has no power on you! 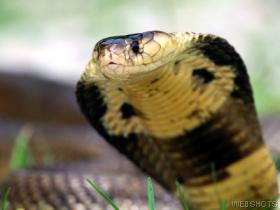 One night, a cobra and a viper entered the house, and hid themselves in the heaps of dried stumps and leaves kept in the corner of the house, which were being used as firewood. She was upset. Whom she would call at night to help drive away the two big deadly snakes? She cried unto the Lord. The Lord told her, My eyes will be on these snakes. Do not fear! She mustered courage and called the children. She told them that nothing would happen without the knowledge of God. Then they prayed, took supper and went to bed. She was awake, and told the Lord, Lord, it is only at night the snakes go in search of their prey. The Lord again told her, My eyes are on these snakes. Like this two days passed by. On the third day, when she was attending to the household work, the Lord asked her, How do you live in this house fearlessly? Raising her hands, she answered and said, Lord! It is because of You. Then a strange thing happened. She saw herself as tall as a palm tree. When she asked the Lord to reveal the secret, the Lord told her that though she stood physically on the ground, she was spiritually seated with Christ in the heavenly place. The Lord again posed a question to her, My daughter, you have 6 daughters and one son. Your husband is no more. You do not have any possession in this world. There is a woman who has one daughter. She has prayed to Me many times for the marriage of her only daughter. But, you have never told Me how you would get your daughters married. What is your hope in this world? She replied, Lord, You are the Head of my family Then the Lord asked her to testify to this everywhere. Thereafter, the snakes left the house on their own. Oh Lord, Help me to perform my duties properly and with godly fear, holiness and wisdom. Because of her flaming love for Christ and because of her fellowship of suffering with Christ, she was able to feast on Christs love and sitting at His feet and learning from Him gave her indescribable joy. Jesus wept over the tragic end of the worldly nations and over the pathetic condition of the churches. She also wept with Him. Jesus was also grieved at the backsliding state of the churches, which had begun in the Spirit. He also revealed the importance of the institution of the holy marriage and its present state. Will you bear My burden and tell about My agony in every church, notwithstanding any objection to it? Until My second advent, will you preach My gospel along with your testimony? Jesus pleaded her. During this period, Jesus also explained to her the importance of the truths concerning baptism, confirmation in the Spirit, etc. He also explained to her the need of the pastors to be filled with the Spirit and fire and with the passion for the lost souls as and when they lay their hands on the youths who receive confirmation. Pointing to the backsliding state of the pastors in the churches and the present condition of the churches, Jesus shed tears along with her. Jesus asked her to tell all the churches about the burden on His heart. He also revealed to her the backsliding state of the Pentecostal churches. He also convicted her of her disobedience to His voice on some occasions when she refused to pray in some prayer meetings when inspired by the Holy Ghost. The Holy Spirit convicted her of many lapses for which she sought His forgiveness. On some occasions, when the Lord asked her to inform her husband of his shortcomings in his spiritual life, she refused to obey Him on the plea, Lord, You should speak to him. Now that the Lord brought the soul of her husband from the heaven before her, she asked him for his forgiveness. As soon as she expressed her regret, the Lord took him back into the Heaven. The Lord revealed to her the various stages in the growth of spiritual life. He also took her to the first, second and third heavens in a similar manner as the apostle Paul was taken unto the third heaven. The first heaven is the place where the saints on the earth and the saints of the heaven meet for prayer and conversation. The second heaven is the place where we commune with the saints of heaven, which is in accordance with the Apostolic Creed, which states, we believe in the communion with the saints. The joy she had experienced in this part of the heaven was indescribable. In the third heaven, the Lord showed her the glory of the heaven, and the sea of glass. The heavenly worship was glorious, whereas the worship service on the earth has become short of holiness. If the worship on the earth is holy, the saints of the heaven and the angels would partake of it, she writes. According to her, the foretaste of the heavenly worship was indescribable, and there are no words to express the joy she had while partaking of the heavenly worship. As led by the Holy Spirit, she began a gospel ministry christened as Self-Denial Evangelistic Team in 1952. This team used to stay in a local church for 2 days in a month and to evangelize the surrounding villages. Though some Christians opposed her ministry saying that there was no need for such meeting as the people who took the infant baptism stood saved, the Bishop of Thiruneveli Diocese supported her and commanded the church leaders to assemble and pray for their salvation every night. The Lord revealed to her how the people who lived in the days of Noah did not believe the message of Noah. When the floods swept them, they approached Noah seeking forgiveness of their sins. The Lord did not show mercy towards infants of even three months age. God blessed her with seven children. The first daughter, Daisy Kohilam, was born in 1930, the second daughter Grace Lydia in 1932, the third daughter Joyce Ruby in 1934 (8-12-1934), the fourth daughter Emi Alice in 1936 (7-9-1936), the fifth daughter Hepsibai Buelah in 1940 (28-3-1940), the sixth son Devasahayam Samuel in 1943 (3-4-1943), and the last daughter Clara in 1945 who passed into glory when she was 2 yeas old. One night she was on her way back to home after conducting a gospel meeting in a nearby village, over a distance of 4 miles. The Holy Spirit talked to her revealing the future events. She did not feel the fatigue in her body during this strenuous long walk because she was in deep conversation with her beloved Lord. While unfolding His plan to her, the Lord revealed to her that He would call her daughters i.e. Daisy Kohilam (married and with a 4 year old daughter), Emi Alice (spinster) and Ruby Joyce (spinster), (who were all undergoing educational courses as teacher), to the Heaven to be with Him. The Lord asked her to glorify Him in the premature death of her daughters. She was completely upset. Her daughters who had scored good marks in their examinations despite their penury were about to earn now. She had mortgaged their small house and raised some money for meeting their educational expenses. She wrestled with the Lord praying to Him not to take away them from this world. She asked the Lord to let her know why He wanted to do so. Was it due to any sin? The Lord spoke to her, I know you and your children. I want to make them living martyrs. Many of My people deny me and become disheartened when I take away the lives of their small children, saying, The Lord is blind. So you have to witness to many people and to glorify Me in the death of your children. She reminded the Lord that He called home her 2 year old daughter Clara, she did not murmur but washed and dressed her dead body for burial and sang songs in glorification of His Name, sitting by the side of her dead daughter. She also reminded Him that when He took away her husband, she glorified God. Tears rolled down her cheeks copiously. She did not inform either her children or anybody about the divine plan. As the days passed by, her daughters finished their education and got jobs as teachers. Within 6 months, two of her daughters fell ill. However, the family devotion continued as usual despite their sickness. When the sick daughters asked her, Why are you silent these days? She simply told them that she was singing in her heart to the Lord. The sick children did not murmur at all and were happy in the Lord. Again, the Lord spoke to her about His plan of calling home her third daughter Joyce Ruby, My beloved daughter, I will take away your beautiful daughter. Will you testify to others by the side of her dead body? She told Him, Lord, how is it possible to do so? Even Mary did weep over the death of Lazarus. Even when my children do not eat, the food will never enter my mouth. How can I praise You and testify when she is dead? Then a Bible verse came to her mind exhorting her to sing with the spirit and also to sing with the understanding (1 Cor.14:15). The Lord spoke to her, Your daughter would put on a spiritual body without sin; she would go to the heaven to live with Me happily. People should know that I came to this world for this purpose. It grieves Me that though people heard many testimonies about this, they have hardened their hearts and have not believed Me. You have to testify to this to many people. After some days, her daughter Joyce Ruby passed into glory on 17-11-1956. When the body of Joyce Ruby was laid for burial, a servant of God testified that her face radiated glory like an angel. Ammal and her family sat around her body, and sang hymns, clapping their hands. Many people testified that a Christian family in bereavement should be like this family. Then the Lord spoke to her, asking her to see her daughter Ruby in the company of saints and angels through her spiritual eyes of faith. After some days, her eldest daughter Daisy Kohilam also fell ill unto death. She was married with a four-year-old daughter. She also passed into glory on 1-4-1959. When her body was taken to the graveyard, they sang hymns and recited the Bible verses on their way to the cemetery. One catholic nun testified that the face of Daisy radiated the glory of God to such an extent that she felt like lying beside her in the coffin. The following day, the Holy Spirit led Ammal to do a ministry in the nearby village. The people who visited her house to offer their condolences could not find her in the house. After some days, her other children talked to one another, Our elder sisters have gone to be with the Lord. They are now living happily with our father and grandparents in the heaven. But we are suffering in this world. When shall we go to the heaven? On hearing this, she immediately rushed to them and told them that she had requested the Lord to preserve them. When she asked them if they had the fear of death, they answered in the negative. O death, where is thy sting? O grave, where is thy victory? The stint of death is sin; and the strength of sin is the law. But thanks be to God, which giveth us the victory through our Lord Jesus Christ (I Cor.15: 55-57). I am the eldest one of the six daughters born to a godly couple who hailed from Christia Nagaram, Thirunelveli District. I have one brother also. My youngest sister died in her childhood. My parents brought us up in His ways. Since the Lord loved us very much, He had shown all forbearance and longsuffering to us whenever we grieved Him. My parents did not give us any medicines whenever we fell ill and only through their prayers, the Lord healed us. Though the cords of death surrounded us, the Lord did deliver us. After the death of our beloved father, the responsibilities of our family fell on my shoulders. He died on the Good Friday, 3rd April 1947. The entire family was dependent on me as I was earning as a primary school teacher. Despite the penury, the Lord was leading us wonderfully as He led the people of Israel in the wilderness. He helped us to cross many Red Seas in our life. The Lord loved me very much since my childhood. However, I was postponing my decision to accept Him as my personal Savior though the Lord was speaking to my heart. Many people of God told me that there were two ways before us i.e. a way of death and another way of Life. I was convinced that since there were a hell and a heaven I should not live according to my own ways. I began to think of my soul and to pray both in the morning and at night with tears. All of a sudden, I could not eat my food due to some infection in my throat. I started bleeding from my throat. My mother and other people of God prayed for me. I did not believe in the divine healing though the Lord performed many miracles of healing in our family. I decided to go to the hospital and spent Rs.800/- in two months on medical treatment. Even then, I was not cured. I was very scared. If I died at this stage, where would I go? I sought Him with all my heart through prayers. The Lord came in search of me. On a Christmas day, the Lord gave me a vision and saved me from the sin. He gave me a joy, which the world could not give me. After I had received His peace and salvation, the Devil began to afflict me. He tried his best to defeat us by bringing all sorts of trials and tribulations to us. One day, as I was praying to God with tears, He asked me to read Isaiah 41:10, 13. Since I had not read this Bible portion earlier, I began to wonder as to what this Bible portion would mean to me. As I opened the Bible and read these verses, I was comforted. Fear thou not; for I am with thee: be not dismayed; for I am thy God: I will strengthen thee; yea, I will help thee; yea, I will uphold thee with the right hand of My righteousness. For I the Lord thy God will hold thy right hand, saying unto thee, Fear not: I will help thee (Is.41: 10 & 13). After some days, her fourth daughter Emi Alice also fell ill. She was very beautiful and was working as the Headmistress of an elementary school. She used to teach the other children in her village on the Word of God and good spiritual songs, apart from teaching the school children. Due to ill health, she resigned her job. Emi Alice informed her mother, If it is Gods will, I will live. Otherwise, do not worry about me. All of you should live happily. The entire family and other believers fasted and prayed. She and her children fasted for 40 days and prayed. Ammal continued to fast for 90 days by taking some light refreshments. During the church services, special prayers were offered for the healing of Emi Alice. Grace Lydia, her elder sister, wrote to Oral Roberts of America to pray for the healing of Emi. Oral Roberts sent a reply stating, You need not worry if you have no worldly possession because you have treasure in the heaven. The Lord will do His will. I have asked the churches in America to pray for your sister. Oral Roberts sent her a handkerchief after prayer and stated that if it was Gods will, she would be healed. Despite all these intercessory prayers for the healing of Emi Alice, the Lord revealed to Ammal that He wanted to call Emi Alice into glory. When the death neared her, Emi Alice called her mother and told her that a bright light surrounded her, and that though the death looked like the night, it shined like the day. In a vision, Emi saw a man in white apparel that told her that her dress was white as snow. Emi told her mother and others that the angels of God would come down and take her to the heaven where she would meet her father, elder sisters, grandparents, uncle, aunt, etc. The following day, a song sprang in the heart of Ammal. It is given below. We seek the heaven and its glory; joy in the heaven is indescribable. How it could be when we see and enjoy it! Then Emi Alice gave a message from John 3:3 and bade farewell to those around her. Some people requested her to pray to God for allowing her to stay in the world for some more days. She answered to them, saying, I am going to live in a holy land without sin. How can you ask me to live for some more days on this earth? You should seek forgiveness from God for asking me like this. Then all of them prayed to God seeking His forgiveness. When her younger brother Samuel and younger sister Hepsibai wept bitterly, she comforted them. Her elder sister Grace Lydia wept and said, We have all taken passports for visiting Ceylon to see our uncle and aunt there. Emi answered to her, saying, After reaching the heaven, I will be able to see my uncle and aunt who are in Ceylon. However, all of you cannot see me when I will be in the heaven. Then Emi reminded her mother about a new Sari (an Indian dress for women) purchased for her. Since she fell ill, she could not wear it. She now asked her mother to bestow this Sari upon some poor woman because this Sari, if wrapped around her dead body, would be eaten away by termites. She asked them to sing certain hymns after her death. After some time, she told them, I now see a group of angels and saints along with a golden chariot. Are you able to see them? However, those around her could not see what she had seen. Then, with a smiling face, she passed into glory on 15-8-1959. After the demise of Emi Alice, the Lord gave an opportunity to Ammal to see and talk to her daughter in the heaven. Emi told her mother that she was given a good place in the heaven with a golden crown and with a white dress and that she rejoiced there. Ammal was blessed with seven children. Three daughters passed into glory and the youngest daughter died in her childhood. She was left with two more daughters and one son. Ammal prayed to God that her remaining children should not get married so that they might avoid the family life, which was full of struggles because she had herself suffered a lot after marriage. However, the Lord revealed to her that they should get married and that their marriages should be conducted in a holy manner and according to His will. In 1962, her elder daughter Grace Lydia was married to a servant of God N.Samuel, an apostle of Christ in India, who hails from Nilgris, Tamil Nadu. Bro.N.Samuel publishes a Tamil Magazine, which contains spiritual food and the message of the Cross. He uses to go to the Himalayan countries every year to preach the gospel. Grace Lydia, the wife of Bro.N.Samuel passed into glory on 28-6-1996. Bro.Samuel has two sons, namely, Sundar Singh and Charles Finny. The other daughter Hepsibai Buelah was married to an evangelist G.Sundarapandian. They have two daughters Sarah Solomon and Elizabeth, who were since married. The only son of Ammal is Rev.T.Devasahayam Samuel, an ordained pastor of Church of South India, Tamil Nadu. He was married to Betsy on 26-5-1972. Both Samuel and his wife were missionaries in the State of Gujarat for many years. Betsy Samuel passed into glory on 29-1-1999. Rev.Samuel has one married daughter, namely Mrs.Benitta Margaret and two sons Alpheus Jegaraj and Jernaus Britto. The Tomb of Jesus is Empty! WILL YOU RECOGNIZE CHRIST AND HIS BODY TODAY? You can find the living Christ only in the midst of His people who are united together in His body, and not in the midst of dead churches who do not believe in the power of His resurrection and who are not of His one Body. Let us not seek the living among the dead! On the first day of the week, Mary Magdalene went to the tomb of Jesus early, while it was still dark, and saw that the stone had been taken away from the tomb. Dearly beloved in Christ Jesus, will you envision that you had gone to the tomb along with Mary Magdalene? In your life, you have lost all the hope of living with your estranged spouse or you have lost the hope of restoration of things that were stolen by the Devil or you have lost the hope of divine healing. The Holy Spirit exhorts you today to see the empty tomb and the resurrected Christ through the eyes of Mary Magdalene. Like Mary Magdalene, you should be the first person to see the resurrected Christ in your life today. Your hope has now risen from the dead. The impossibility has now become a possibility. Remember that when Christ rose from the dead, you also rose along with Him. In your life, there must be an empty tomb. Because of your lack of faith in Him, you had buried Christ in a tomb. But Christ cannot be buried for long. Even if you are faithless, He remains faithfully and cannot deny Himself (2 Tim.2:13). This is the secret of His love for you. As you stand near the empty tomb weeping, you receive a message of the angels, Woman, why weepest thou? Today, this angelic message from the Glory of His Cross Prophetic Ministries comes to you. As you turn around, you can hear His voice, Woman, why weepest thou? A new hope dawns on your spirit now as you read this message. As commanded by the Lord, Jeremiah the prophet went to the potters house where the potter was making some thing at the wheel. And the vessel that he made of clay was marred in the hand of the potter; so, he made it again into another vessel, as it seemed good to the potter to make. Then the Lord said to Jeremiah, O house of Israel, can I not do with you as this potter. Look, as the clay is in the potter s hand, so are you in My hand, O house of Israel (Jer.18: 1-6). Dear child of God, you are the clay in the Lords hand. God allows the trials and tribulations that you face with a special purpose. Your faith is being tested through fire. No doubt, you were marred in the hand of the Potter. However, the Potter still holds you in His hand to make you again into another vessel. He will not rest until another vessel is made. Do not resist the tempest, which is allowed of God to make you into another vessel. Through every suffering, the Lord is making you into a vessel of His choice. Woe to him who strives with his Maker! Let the potsherd strive with the potsherds of the earth. Shall the clay say to Him who forms it What are you making Or shall your handiwork say, He has no hands? Woe to him who says to his father What are you begetting or to the woman, What have you brought forth? (Is.45: 9-10). Dear child of God, you are the clay in the Potters hand. The Lord chooses only humble people like you who consider themselves as the clay taken from the earth. You may not consider yourself as a vessel of gold or of silver. Baptist John cried: Every valley shall be filled and every mountain and hill brought low. (Luke 3:5). Those servants of God who exalt themselves as the mountain and hill, or who consider themselves as the golden or silver vessels in the Hand of God just because they have been bestowed with certain spiritual gifts, shall be brought low, and those servants of God who consider themselves as the dust of the earth or as the valley shall be filled. Dear servant of God, you may not be a great orator on the pulpit. You may not have enough money to organize any evangelical crusade. But, if you are a man with a contrite and humble spirit (Is.57: 15), you will become the clay in the Potters hand and the Lord will make you a vessel of His choice. Though you were marred in His Hand in the past, you will be shaped and made into another vessel meet for the Masters use if you have a humble spirit. The Lord tells you, As the clay is in the potters hand, as are you in my Hand. Who are blessed in the sight of God? Blessed are the poor in spirit: for theirs is the kingdom of heaven (Matt.5:3). Who are the poor in spirit? They are humble enough to bear the reproach for the sake of His Kingdom. They are not haughty. They are always in the process of learning. They will never say, I have learnt. They learn even from a child. They do not practice hypocrisy. They are a open book to be read by others. They practice what they preach. Blessed are they that mourn: for they shall be comforted (Matt.5:4). People mourn when they are convicted of their sin or mistakes; when they are bereaved; when they suffer physical or mental pain; when they incur financial losses; when they are reviled or persecuted. We normally ascribe their mourning to some kind of divine judgment. But what Jesus said about those who mourn? He calls them blessed and not cursed. If a child of God suffers physical pain or mental agony, we should call him/her blessed. Perpetua was a married lady 26 years old with a baby at her breast. On being taken before the proconsul Minutius, Perpetua was commanded to sacrifice to the idols. Refusing to do so, she was put in a dark dungeon and deprived of her child, but two of her keepers, Tertius and Pomponius, allowed her out in the fresh air several hours a day, during which time she laws allowed to nurse her child. Finally the Christians were summoned to appear before the judge and urged to deny their Lord, but all remained firm. When her turn came, her father suddenly appeared, carrying her infant in his arms, and begged her to save her own life for the sake of her child. Even the judge seemed to be moved. Spare the gray hairs of your father, he said. Spare your child. Offer sacrifice for the welfare of the emperor. Perpetua answered, I will not sacrifice. Are you a Christian? demanded Hilarianus, the judge. I am a Christian, was her answer. Perpetua and all the other Christians tried with her that day were ordered killed by wild beasts as a show for the crowd on the next holiday. They entered the place of execution clad in the simplest of robes, Perpetua singing a hymn of triumph. The men were to be torn to pieces by leopards land bears. Perpetua and a young woman named Felicitas were hung up in nets, at first naked, but the crowd demanded that they should be allowed their clothing. When they were again returned to the arena, a bull was let loose on them. Felicitas fell, seriously wounded. Perpetua was tossed, her loose robe torn and her hair falling loose, but she hastened to the side of the denying Felicitas and gently raised her from the ground. When the bull refused to attack them again, they were dragged out of the arena, to the disappointment of the crowd, which wanted to see their deaths. Finally brought back in to be killed by gladiators, Perpetua was assigned to a trembling young man who stabbed her weakly several times, not being used to such scenes of violence. When she saw how upset the young man was, Perpetua guided his sword to a vital area and died. When Abram was ninety years old and nine, the Lord appeared to Abram, and said unto him, I am the Almighty God; walk before me, and be thou perfect. And I will make my covenant between Me and thee, and will multiply thee exceedingly. And Abram fell on his face: and God talked with him, giving him wonderful promises. The Lord also told Abram, Neither shall thy name any more be called Abram, but thy name shall be Abraham: for a father of many nations have I made thee. Here, the Lord revealed Himself to Abram as the Almighty God, which means, in Hebrew, El Shaddai. Even to your old age I am He; and even to hoar hairs will I carry you; I have made, and I will bear: even I will carry, and will deliver you. God will never forsake them. He will carry them on His shoulders and will take them into the Heaven after their death. Like Abraham, they can also get wonderful promises from God for their children, grand children, etc. God will honor His promises made to them concerning their posterity. They are better than the Abraham of the Old Covenant is. All the promises of God to them are Amen in Christ Jesus. The Lord asked Abram to walk before Him, and to be perfect. The Old Testament saints had to obey Gods commandments with their own strength. However, under the New Testament, we have the indwelling Holy Spirit to enable us to overcome the sin, and to obey His commandments. We can walk before our God and can be perfect, not by our own strength but His grace through the Spirit. Dearly beloved in Christ Jesus, are you facing a difficult situation in your life today? The Almighty God is with you because you are in Christ Jesus. Our God is greater than your problem and is mightier than your enemies or the devil. El Shaddai is His Name! You should fall on your face and pray to Him like Abraham, to get His personal promises for you. If you fall on your face before Him, it will show that you are completely dependent on Him, realizing your unworthiness. God will move mightily in your life and ministry. These days, we find it difficult to kneel down even on the cushions in our churches and pray. Whenever I faced some problem in life, I used to fall prostrate in my secret chambers, and pray to God. The Lord did move mightily in my life, and performed miracles for me. Today let us pray for the aged parents, grand parents, or the old people in our families. Oh, our loving Heavenly Father, We thank and praise You for our dear parents/grand parents who are with us. As You had blessed Abraham in his old age, we pray that You may bless our aged parents/grand parents with good health and long life. Forsake them not when their bodily strength fails. We pray that You may give them revelations and visions, according to Your promise that in the last days our old people would see dreams. In Jesus Name, we pray. Amen. The Old Testament saints got the revelation of God as their Shepherd. Moses had known God as the Shepherd of the Israelites. In Psalm 78:52-54, we find that God had led His people in the wilderness as their Shepherd. Prophets Isaiah and Ezekiel through their prophetic eyes had the wonderful revelation of Christ Jesus as the Shepherd, who would search His sheep, seek them out and feed them (Is.40: 11-12 & Eze.12-13 and 34:23). However, none of the Old Testament saints other than David did call their God as my Shepherd(Ps.23: 1). David was himself a shepherd who tended his fathers sheep and protected them from the lion and the bear (I Sam.17: 34-35). The Lord Himself said to David, Thou shalt feed (shepherd) My people, and thou shalt be a captain over Israel (2 Sam.5: 2). As such, he knew the relationship between a shepherd and his sheep and thus called His God as my Shepherd. David through his prophetic eyes saw the coming Shepherd. Yet, he could not enjoy the full fellowship of the Shepherd in his life because Christ had not been manifested in flesh at that time. Of course, he did have the foretaste of Christs love to some extent when God forgave him of the grave sin of adultery. However, under the New Covenant, we are more blessed than David because the Shepherd indwells us. The Lord is My Shepherd; I shall not want (Ps.23; 1). Every Christian knows this verse by heart. Our children can recite the entire psalm No.23. This verse compresses the whole love of God for us. I may not remember many of Gods promises in His Word but may remember only this verse. Some may shrug off this psalm as an elementary lesson for the new believers. However, this verse of Psalm 23 has more significance than meets the eye. You may have known Jesus as your Savior, Baptizer of the Holy Ghost, Miracle Worker, Healer, Comforter, Protector or Friend. But all these revelations encompass His Name The Lord my Shepherd i.e. Jehovah Raah in Hebrew. The Lord is my Shepherd because He has forgiven my sins and iniquities through His precious blood. He is my Shepherd because He has baptized me in His Spirit. He is my Shepherd because He performs miracles for me. He is my Shepherd because He comforts me. He is my Shepherd because He heals me by His stripes. He is my Shepherd because He sticks to me as a friend. He is my Shepherd because He protects me from my enemies, accidents and diseases. When my beloved mother and my beloved father-in-law (both entered glory) were on their deathbeds, I uttered this verse into their ears and asked them to repeat this verse so as to strengthen their faith despite their bodily weaknesses. If I get the revelation of Jesus as the Lord my Shepherd, I shall not want in any thing in this life. I need not go to God with a begging bowl in my hand because the Lord my Shepherd provides all my needs as I am His sheep. As His sheep, I feel His abiding presence, His healing touch, His warmth protection, and hear His words of love and of comfort. As my Shepherd, He feeds my family and me daily both with physical and spiritual food. Let your children who are not successful in their education/career confess through their mouth, The Lord is my Shepherd; I shall not want. Let the rulers of your nation not depend upon their might for protection but confess, The Lord is my Shepherd; I shall not want so that your nation can be saved from terrorism or war. Dear pastor, let your congregation confess, The Lord is my Shepherd; I shall not want so that they can reap great harvests of blessings from God. Dear evangelist, present Jesus as The Lord my Shepherd to the lost. The whole gospel is summarized in this verse because Jesus, the good Shepherd had come in search of the lost and had laid down His life on the Cross for His sheep. In the beginning God created the heavens and the earth (Gen.1:1). Our God is the Creator of the heavens and the earth. He is the Creator-God i.e. ELOHIM in Hebrew language. He created every thing through His Word, i.e. Christ (John 1:3). Have you suffered a grievous and unbearable loss in your life? Has the Devil stolen from you the good things like joy in your married life or your health or your wealth? Have you been in the furnace of afflictions for a very long time, losing all your faith in our Lord? The Lord now wants you not to remember the former things nor consider the things of old. The things that existed till yesterday are the former things or the things of old. You should not remember them today. Because the Lord is going to do a new thing today. NOW (as you read this message) IT SHALL SPRING FORTH (Isaiah 43:15-21). He is going to create something new in your life because He is ELOHIM. He reveals Himself to you as the Lord, your Holy One, the Creator of Israel, your King (Is.43:15). As the Creator of Israel, He creates absolutely new things which you have neither seen nor heard since the beginning of this world (Isaiah 64:4). This promise is meant for His chosen people. He is your King, seated on a high throne above the worldly and the devilish kingdoms. In the 37th chapter of the prophetic book of Ezekiel, God commanded Ezekiel to prophesy unto the dry bones (Verse 4). As soon as Ezekiel prophesied unto the dry bones, the work of creation began in the dry bones with the result breath came into them, and they lived, and stood upon their feet, an exceedingly great army (Verse 10). The Holy Spirit commands you to prophesy upon these bones and say unto them, O ye dry bones, hear the word of the Lord. These days, we attach little importance to the gift of prophecy or the ministry of prophets. Less emphasis is laid on the gift of prophecy, whereas undue emphasis is laid on the gift of tongues as in the days of the Corinthian Church. Please note prophecy is as important as prayer. Prophecy can be distinguished from prayer. A prayer proceeds from man to God, whereas a prophecy proceeds from a holy man of God to another man or a people or a kingdom or a nation including animate and inanimate things as he is moved by the Holy Ghost (II Pet.1: 21). An inanimate thing has the ear to hear the word of the Lord. For instance, the wind hears His Word and obeys Him (Mark 4:39). When you utter the word of God and command in Jesus Name, the inanimate things or the natural forces as moved by the Holy Ghost, will obey you. Please read Matt.21:19-22. Jesus said, If ye have faith, and doubt not, ye shall not only do this which is done to the fig tree, but also if ye shall say unto this mountain, Be thou removed, and be thou cast into the sea; it shall be done. A prayer conveys mans words, whereas a prophecy conveys Gods words. Prophecy is more important than any other human effort in reviving either backsliding children of God or dead souls. A word of prophecy creates something new. Prophecy can change the course of history of a church or a nation. Prophecy can also bring about divine judgment and can cause the rise or the fall of a kingdom. Jesus spoke the words of prophecy to Jerusalem in Matt.23: 37-39 and accordingly the judgment of God devoured Jerusalem in A.D.70 through Roman destruction. A word of mouth from a holy prophet can either create or destroy a thing. Be discreet in prophesying unto the people. Do not openly or directly address them as dry bones as this would lead to misunderstanding amongst the hearers. Be careful. You have to prophesy unto the dry-bones, not to the hearing of the bodily ear. As you are about to preach or intercede in prayers for others, you may speak the words of prophecy silently so that the spiritual ears and not the physical ears may hear them. As you prophesy in Jesus Name, the Creator-God ELOHIM creates a new thing in your life. Will you please meditate on I Kings 18:41-48? The Lord has a message for you. In the days of Elijah, the prophet and Ahab, the King of Israel, there was a drought in the land of Israel. Similarly, you may be facing a spiritual drought in your life or ministry. Go up, eat and drink, for there is the sound of abundance of rain, Elijah tells Ahab. Ahab, accordingly, went up to eat and drink. Elijah went up to the top of Carmel, bowed down on the ground and put his face between his knees. Elijah said to his servant, Go up now, look toward the sea. Then it came to pass the SEVENTH TIME that the servant said, There is a cloud, as small as a mans hand, rising out of the sea. So Elijah said, Go up, say to Ahab, Prepare your chariot and go down before the rain stops you. Now it happened, in the mean time that the sky became black with clouds and wind, and there was a heavy rain. Dear child of God, you would have sought the intercessory prayers of some minister of God for a miracle in your life. Since you have experienced no miracle, you have now become disheartened. Six times you have seen nothing. Now the SEVENTH TIME has arrived in your life, and you are hearing a small voice Go again. As you read this message, you can see a small cloud, as small as a mans hand. You can now see a little evidence of the ensuing great blessing upon your life. With this small cloud, you should now trust God and be happy. There will be a sudden outpouring of His blessing in your life. Dear minister of God, there will be a great outpouring of His anointing on your ministry in a manner never imagined by you. The God of Elijah is alive today to perform the same miracle for you. Amen. God said to Moses, An altar of earth you shall make for Me, and you shall sacrifice on it your burnt offerings and your peace offerings, your sheep and your oxen. In every place where I record My name, I will come to you, and I will bless you (Exo.20: 24). You might have already made an altar of earth by sacrificing some thing or the other in your earthly life for the Lord. It may be a sacrifice of your time and comfort for intercessory prayers. It may be your sacrificial offerings for the missionary work. It may be your sacrificial financial help for an orphanage or an old age home. It may be your sacrificial offerings to your church. You might have offered a portion of your house or land for the Lords work. In your office, you might have served your employer in a sacrificial manner, fearing God. The Lord now says to you, I will come to you and I will bless you because He has recorded His Name in that very place where you have sacrificed for Him. Dear pastor, you would have continued to sacrifice your time and comfort for serving your congregation members without expecting any reward from the Lord. Dear evangelist, you would have traveled far and wide to preach the gospel at the cost of your health. It is now time for the Lord to come to you and to bless you. You need not ask Him for His blessings because your sacrifices have come up for a memorial before God. He remembers all the sacrifices made by His people at the altar, and needs no reminders from them in this regard. The quantum of your sacrifice hardly matters here. Even if you have given 1$ to our God, it means that you have sacrificed that 1$ because you could have spent that money for meeting your own need. In the sight of God, that 1$ is very precious because you have sacrificially given to Him. God will definitely visit the place of your sacrifice i.e. the altar. He now comes to you with His hands full of blessings. His blessings may be a mighty anointing of His spirit on your ministry or an abundance of His finances. As you read this message, you can see your Lord standing by your side and can hear His small voice, I have come to bless you Amen. Thou art all fair, my love: there is no spot in thee exclaims the Bridegroom, looking to His bride, in verse 7 of Chapter 4 of the Song of Songs. The bride is always in the habit of looking down upon her in contempt saying, I am swarthy. But the divine Shepherd reminds her repeatedly in the Song, Thou art fair. In this particular verse, He goes a step forward and exclaims, How beautiful you are! You may not look beautiful in your own eyes or in the eyes of other children of God surrounding you. But, in His eyes which are like a flame of fire (Rev.1: 14) searching your while life, you are indeed beautiful. He only knows how beautiful you are. This is His testimony concerning you. He does not stop at that. He now confirms His testimony by a positive statement, there is no spot in thee. The Devil or other human beings including your spouse or children can point an accusing finger at you, reminding you of your past life or your weaknesses. But, the divine Bridegroom proclaims, There is no flaw in you, holding His own mirror before you. This is the mystery of the Song of Songs. By self-introspection, you have already condemned yourself and think that you are not of any use in this world. But Jesus whispers into your ears How beautiful you are! There is no flaw in you. Dear bride, arise now and start a new life today with this testimony of Jesus concerning you. You may be a physically handicapped person or a person of dark complexion or of a short stature. But you are precious in His sight (Is.43: 4).